Thick bunches of nerves leave the brain or spinal cord and branch intricately within muscle (fibers of which can be seen running vertically in the background at right). 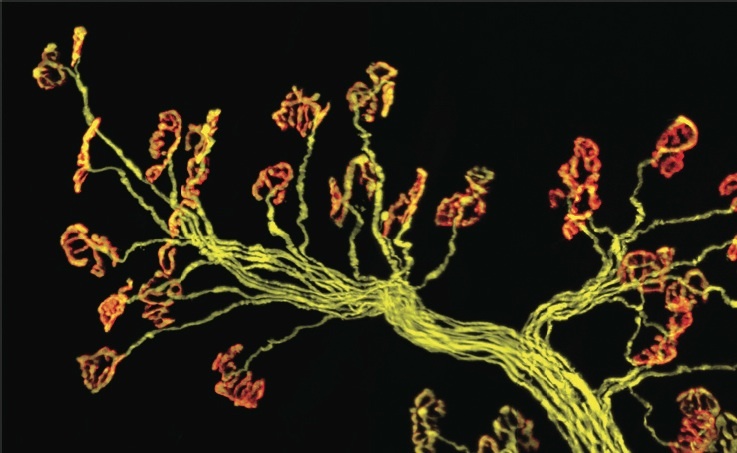 The inset image shows individual axons (yellow) connecting to single synapses (red). The red stain is a snake venom that binds only to muscle receptors; poisonous kraits use it to immobilize their prey. Exercise and caloric restriction both mitigate the degradation of synapses that occurs with age. In the healthy synapse at left, the receiving end, or muscle receptor (red), and the transmitting end (yellow), attached to a nerve, overlay each other perfectly. With age, the synapse literally falls apart, as shown at right. 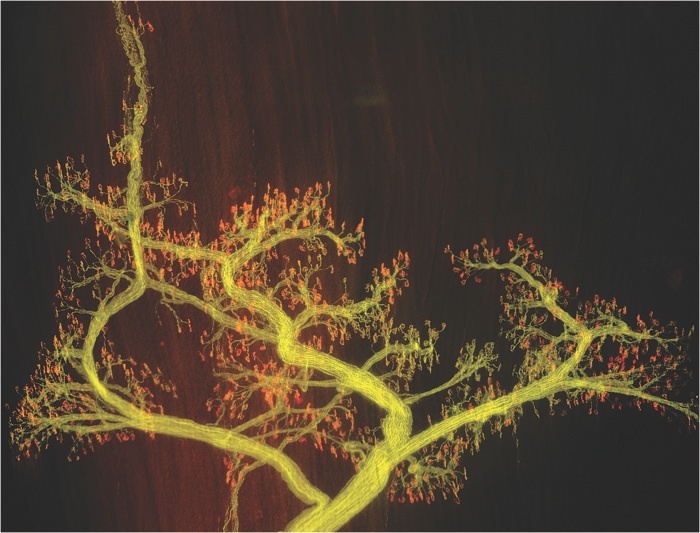 Image courtesy of Valdez, Tapia, Kang, et al. Numerous studies show that caloric-intake restriction (which is known to slow aging in mammals) and exercise have dramatic, beneficial effects on mental acuity and motor ability, says professor of molecular and cellular biology Joshua Sanes, director of the Center for Brain Science. But just how these changes improved functioning was unclear. Now Sanes and a colleague, Knowles professor of molecular and cellular biology Jeff Lichtman, have made a discovery that pinpoints mitigation of age-related structural degradation in neural synapses as the reason for this improvement. According to their research, published this August in the journal PNAS (Proceedings of the National Academy of Sciences), exercise and caloric restriction in lab mice visibly protect and rejuvenate synapses, the neural connections that are critical to cognitive and motor function. 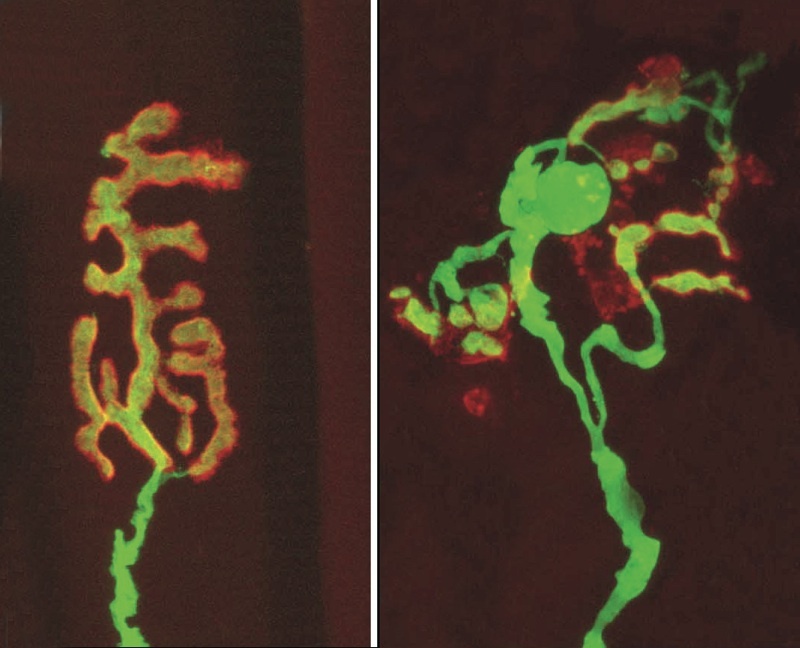 Key to the experiment was a technique developed by Sanes and Lichtman that allows individual synapses to be tagged with a fluorescent protein. (The researchers studied neuromuscular junctions in skeletal muscle, rather than synapses in the brain, because the former are large enough to be seen using a light microscope.) The technique allows investigators to surgically open, and capture an image of, a single tiny synapse, and then find the same synapse later, during a second surgical procedure to observe and document the effects of different protocols.